If you are lucky, you may have had a teacher that made a difference in your life or inspired your future. In Johannes Lictman’s Such Good Work (Simon & Schuster, 296 pages) one teacher learns the importance of being present. The story is narrated by Jonas Anderson, a graduate student struggling with sobriety. Although his problem is with narcotics like oxycodone and its street equivalents, he attends Alcoholics Anonymous because he prefers the maturity of those who share. He still drinks, but it does not “help” like oxy. When he loses his TA position for being “too creative” he makes the decision to finish his education in Sweden. He has both American and Swedish citizenship. He hopes once there, he can focus on his education and live drug free. Jonas finds himself in the dorms with exchange students. He speaks Swedish fluently. He is not good at relationships and is relieved when his friends move on or a girlfriend breaks up with him. As his personal life ebbs and flows, and his sobriety continues, he is challenged to find something meaningful — or he may go back to using. The refugee crisis is expanding and Jonas is inspired to help after there is an appeal for Swedish/English speakers to get involved. When he volunteers, he is moved by the teenage boys who have made it to Sweeden alone. These “unaccompanied minors” appreciate Jonas’ help and he makes friends with some of the boys. After a terrorist attack in France, the Swedish government decides to close its doors to Middle-Eastern refuges. Frustrated with the system, Jonas must choose to ignore the problem or take action. 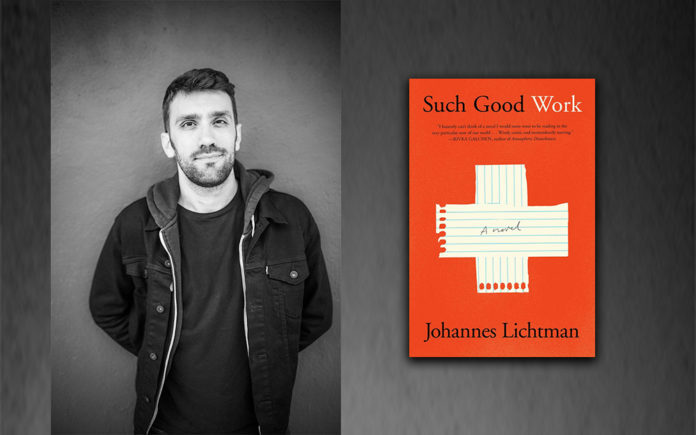 Author Lichtman writes well and does a good job dropping the reader into the protagonist’s thoughts where drugs are constantly at the forefront. Told in first-person, Jonas wants to quit because he sees how drugs have impacted his life. He has lost work, he can’t finish his degree and he feels alone. After Jonas moves to Sweden, he works hard at being sober, but regularly goes out drinking with school chums. However, alcohol doesn’t offer the same relief as narcotics. The relief he seeks is from himself, his thinking and his insecurities. As he gets involved with refugees, he starts to see outside himself and it becomes a fix that drugs could not provide — self-respect, compassion, and empathy. The road is not easy, he is afraid to get close to people and fears what might come from being involved. There are differences between US and EU lifestyles that I found fun and interesting. There are also important insights into the refugee crisis in Europe that we don’t see in the US. In the EU, young boys and teens escape horrendous challenges and terrible conditions to face prejudice and hate. All they want is to go to school, learn the language and be apart of society. “Unaccompanied minors” can be in holding patterns for years before getting placed in a home or boarding house, which means while they are in limbo, they are not in school. They are cared for by the government as minors, but once they age-out there is no longer the support or help they need, thus creating an even larger problem. I like that Jonas discovers helping others is more satisfying than doing drugs, and also appreciated that he had to face his frustration with the tragic refugee situation drug free — a sign that Jonas had finally grown up. As an American abroad, he had to face his own self-centered fear and crippling apathy to see the real world. There is a lot I like in Such Good Work, but the character never reveals how or why he started using drugs. The reader never gets a hint into Jonas’ past or family life, only that his father was American and mother Swedish. Jonas undermines his relationships and believes the worse about himself. But, the longer he stays sober, the more he improves. He faces the pain and finally understands that self-medicating does not change the unfairness and horrors in the world. When you come down, it is still all there. At the end of the book, under no heading, there is a stand-alone page that appears to be from the author. It is about the importance of education as “the most empowering tool we can give children.” He mentions the organization “Save the Children” and the “Return to Learning initiative for refugee children.” Lichtman (I assume) says a “portion of the author advance was donated” to the learning program. In the story, Jonas comes back to the US where he is greeted by one of his first students and discovers he did in fact make a difference. Previous articleBe A Super Bowl Champ With This Safety Playbook!